Wallis Simpson is known as the woman at the center of the most scandalous love affair of the 20th century, but in this surprising new biography, bestselling author Anna Pasternak redeems a woman wronged by history with new information revealed by those who were close to the couple—presenting Wallis as a convenient scapegoat to rid England of a king deemed unworthy to rule. The story that has been told repeatedly is this: The handsome, charismatic, and popular Prince Edward was expected to marry a well-bred virgin who would one day become Queen of England when he ascended the throne. But when the prince was 37 years old, he fell in love with a skinny, divorced American woman—Wallis Simpson. No one thought the affair would last, and when the prince did become king, everyone assumed the affair would end. But instead the new king announced he wanted to marry the American divorcee, and Wallis was accused of entrapping the prince in a seductive web in order to achieve her audacious ambition to be queen. After declaring that he could not rule without the woman he loved at his side, the king gave up his throne, and his family banished him and his new wife from England. The couple spent the rest of their days in exile, but happy in their devoted love for each other. 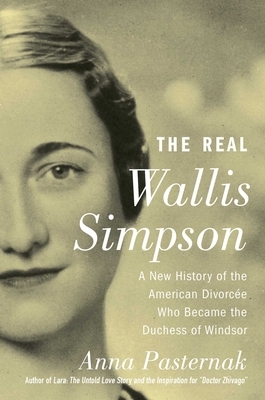 Now, Anna Pasternak’s The Real Wallis Simpson tells a different story: that Wallis was the victim of the abdication, not the villain. Warm, well-mannered, and witty, Wallis was flattered by Prince Edward’s attention, but like everyone else, she never expected his infatuation to last. She never wanted to divorce her second husband or marry Edward. She never anticipated his jealous, possessive nature—and his absolute refusal to let her go. Rejecting the sinister schemer at the center of a dark royal fairytale, Anna Pasternak reveals Wallis Simpson as an intelligent woman, written off by cunning, powerful men and forced into a life she never wanted in a complex, riveting, and tragic true story of manipulation and betrayal. Anna Pasternak is the author of Princess in Love and Lara, which revealed the true story of the love affair behind her great uncle Boris Pasternak’s Doctor Zhivago. Her work has appeared in Vanity Fair, Vogue, Harper's Bazaar, Town and Country, Tatler, and every major British newspaper. She lives in England. "The book does have the Desert Island Discs effect of making you take notice of and see the compassionate, vulnerable sides of someone you’ve subconsciously compartmentalised all your life as too rich, too thin and, let’s be frank, too American....What makes the book unputdownable is Pasternak’s lively and detailed (and thankfully not Mills & Boonsy) retelling of this ever-fascinating, ridiculously poignant love story."